It belongs to my niece Merete. My first visit with Merete (has it really been 26 years???) when my brother and his family moved to New Hampshire from Berlin Germany. I have been building a beautiful blog post in my head all week. I just can't seem to put into words what I want to express. After graduating from Naropa University in Colorado my niece has been working as a journalist, working on various projects, writing and editing for other people. THIS project is her very own. This is no time for my writer's block, so I will let her work speak for itself. After watching the video there is more info here and here. So, every November select artists in Charlottesville and the surrounding counties open their studios to the public. When we moved here last year it was the first thing on my "want to do" list. I wasn't disappointed. Of course we were sure to go again this year. I love seeing the workspaces of other artists. We didn't go to EVERY place like we did last year, our time was a bit shorter. But I was not disappointed by our visits. And I was shopping this time since we are moving away and the tour will not be as convenient once we are both settled back in Fredericksburg. 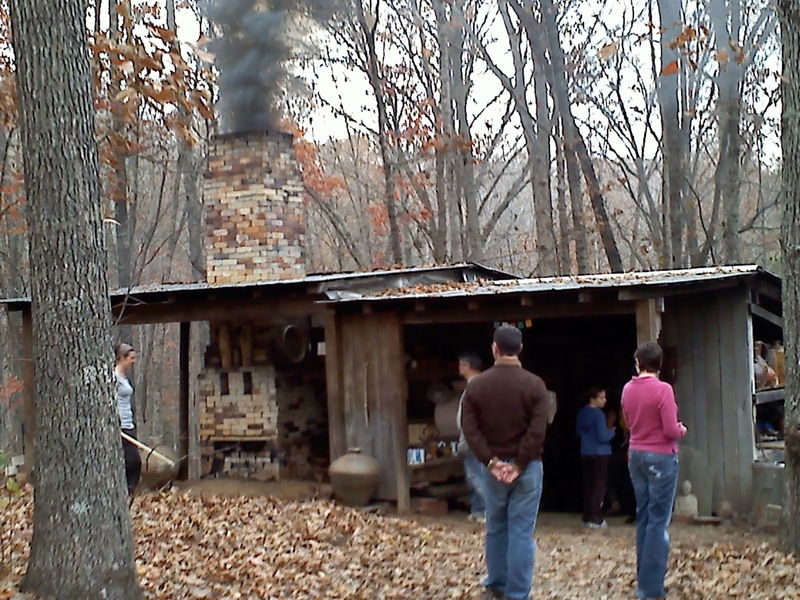 Kevin's kiln shed. Not nearly as impressive as if I had taken a picture from below of the three chambered kiln. Didn't even think of taking pictures till we had made some purchases and were leaving! Kevin's throwing shed turned shop for the tour. Couldn't decide so we bought all three! Greg specifically chose the tumbler for his nightly beer(s). Gotta love those salt affects! We also were sure to stop at Judd Jarvis's place. 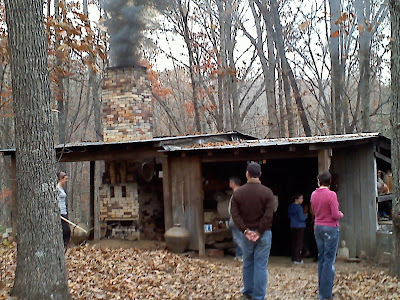 He fires with gas behind his house with a gas kiln he built himself. Every year he and his wife clean out the main living area of their house and turn it into a gallery of his latest work. Judd's another one of those potters so willing to give advice to newer potters like me! Another tumbler for Greg, (looks woodfired maybe?) and a plate for me. We also stopped to see Tavia of Tavia Metal just a mile or two from our house (I had a pair of her silver earrings on my shopping list.) Another fantastic artist and all around great person. We always feel so warmly welcomed when we see her. She even gave us some free tickets for a show in Chicago that I will pass on to my niece at the Art Institute. We ended our day with a yummy pizza at Mellow Mushroom, with a couple G'night Red Imperial Ales. Time spent with Greg, art, beer and pizza. A perfect day. What a BEAUTIFUL Fall day! Fall Shearing at Juniper Moon Farm is always more low key then Spring Shearing. 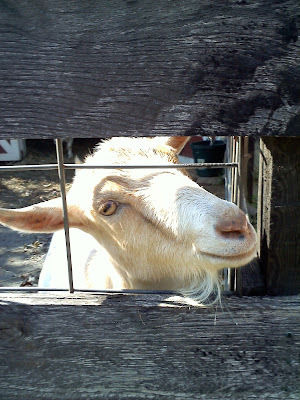 For one thing only the goats (and this year the colored sheep) are sheared, as they are clipped twice a year. Also, this year, Susie has been travelling all over the USA promoting her new yarn line with the Juniper Moon Label. (It is FANTASTIC stuff! Ask for it at your local yarn shop.) Attendance by JMF "aunties" (as the Farm Groupies are called....you can meet us on Ravalry) is lower and it just feels like a family get together. Family that you sometimes have never had the opportunity to meet In Real Life!! Instead of tents Susie set up her Farm store in the garage, with a space for my table of JMF pottery. (Available also on her website here.) She had honey from her own bees this year too! Charlie. Or maybe it's Churchill??? After the haircut. It's amazing how dark the colored sheep fleeces are. The tips bleach out in the sun, so it's easy to forget how chocolatey brown they really are! Greg with my JMF pottery....wouldn't be a show without him. Jerry the llama makes a friend. LOT'S of chickens. They were all just little peepees at Spring Shearing! So in the midst of the pottery, the shows and the moving....my Weaving Guild here in Charlottesville had a dye day! I do love dyeing but rarely do it by myself. It is just so much more fun with a group. Maybe it's all the knowledge shared or maybe it's just because some things have to simmer for quite awhile for good color and its nice to have someone to jabber with while I wait! It was a glorious Fall day. 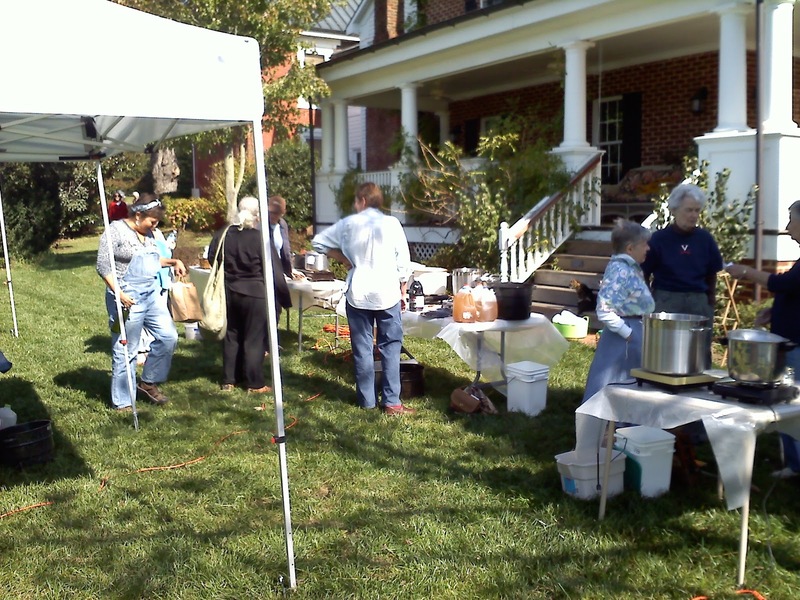 Joanie, the current president of the Guild, had us out to her farm to set up. An AMAZING place. A big beautiful old house with gorgeous grounds. And animals! Both these skeins were OVERDYED, meaning dyed in another color and dyed again, with indigo. Unfortunately I don't know what the first color was (yellow for sure on the right, so maybe goldenrod or annato....) But what fantastic results! I prepared for the day by measuring out a warp of alpaca in sections to be dyed in different colors. This will become a scarf. Walnut, indigo, tumeric, hibiscus overdyed with a weak indigo, and annato. My colors did not turn out as vivid as some. But natural dyes can be amazingly bright. 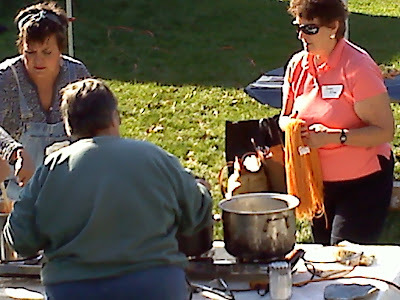 While at Fall Fiber Festival I managed to slip away to peek at some of the other vendors. When I saw the glorious colors of Black Twig Farm I was amazed! And knew I had to make a purchase. Generally I try to avoid buying yarn (since I spin and don't knit much!) unless I plan on weaving with it. But I couldn't walk away from her beautiful examples without taking some home with me. 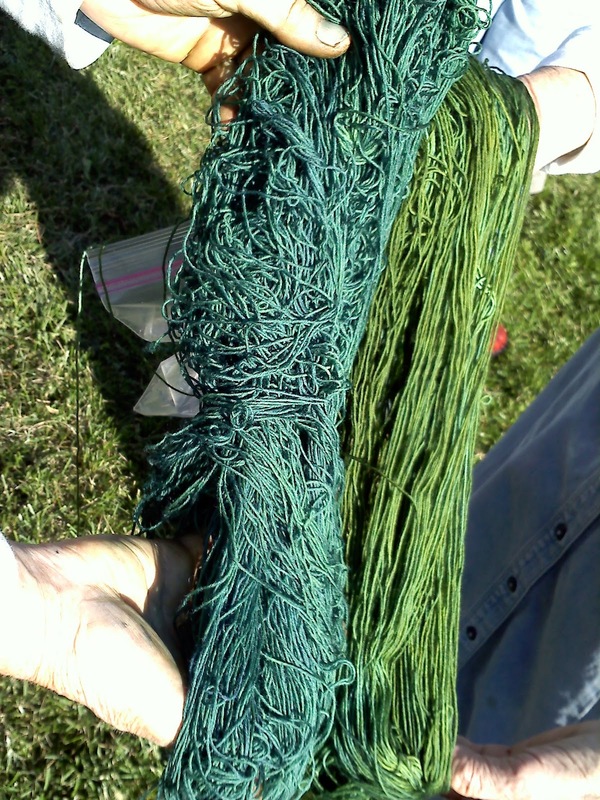 These yarns are mill spun of Churro, a navajo sheep raised on Rachel's farm outside Crozet, right here in Virginia! Back home I have 25 bookmarks on my loom! Nearly half way finished. 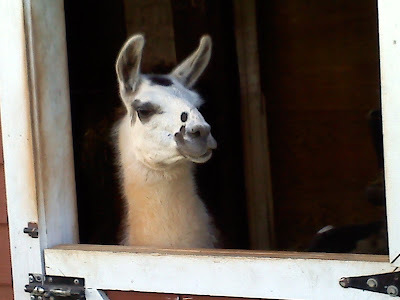 This weekend it's Shearing at Juniper Moon Farm and Greg will be home for 5 days! I can't believe we are already half way through October. OCTOBER. Fall is truly here. The rains continue, the leaves are turning and the breezes have brought us those chilly nights I love so much. 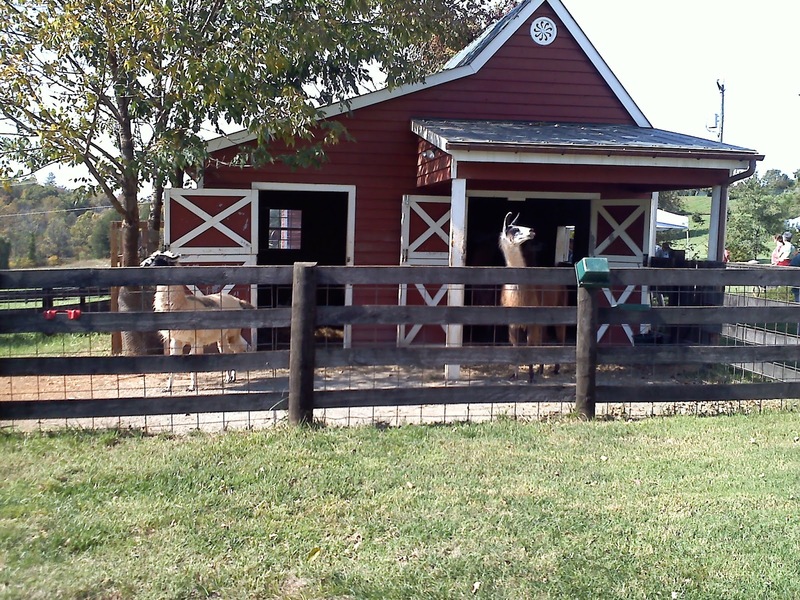 Along with October comes a restocked Etsy Shop, Fall Fiber Festival, the Fredericksburg Spinners and Weavers Guild's "Stitch In", the start to Greg's new job and Fall Shearing at Juniper Moon Farm. Greg armed with The Square ready for big sales! Fall Fiber Festival was a great success! Despite the week of rain, the crew managed to find enough dry land to set up the tents, no one got stuck in the mud and sales were GREAT. Last year was the first year that the board accepted pottery vendors to the mix. I jumped at the chance to be part of a festival that I have attended for YEARS and was so happy to be accepted. The festival is ALWAYS well attended. It is a date reserved a year in advance by most every fiberista in Virginia and the plan is nearly always to SHOP. The weather cooperated, being cool and a bit breezy Saturday and, well, overcast on Sunday but NO RAIN. To make the weekend even better my friend April came up from NC to lend a hand. So with Greg taking money and April helping me set up I had lots of time to talk with customers. It was an awesome weekend. As I said, sales were great (even sold several of my woven towels) and I picked up a couple of easy commissions (more of what I already do) and some wholesale opportunities. VERY satisfying. I tell ya. Fiber people are just the friendliest bunch. The following Saturday I packed up the truck and drove to Fredericksburg for the FSWG Stitch In event being held at LibertyTown Arts Workshop (my alma mater!). This was a charity knitting and crocheting event. Well attended the goal of the day was to promote charitable knitting (and crocheting) for the homeless, hospital patients and others. There were demos, short classes and donated yarn and needles to get you started. A small group of us agreed to be vendors. If I'm not going to knit with it I may as well sell my handspun so someone else can! I rushed home Saturday to get home before dark and to help Greg pack up for his move to Fredericksburg on Sunday. Ya'll will be glad to know that he is tucked into his temporay place and has since finished his first very busy week of work. He's happy! BUT this apart stuff is not too fun. My sights are now set on the list of things that must be accomplished here at the house in C'ville to ready it for sale in the Spring. Painting, (I put up a new light fixture today!) a kitchen update, bathroom heat....with time for throwing pots in between. 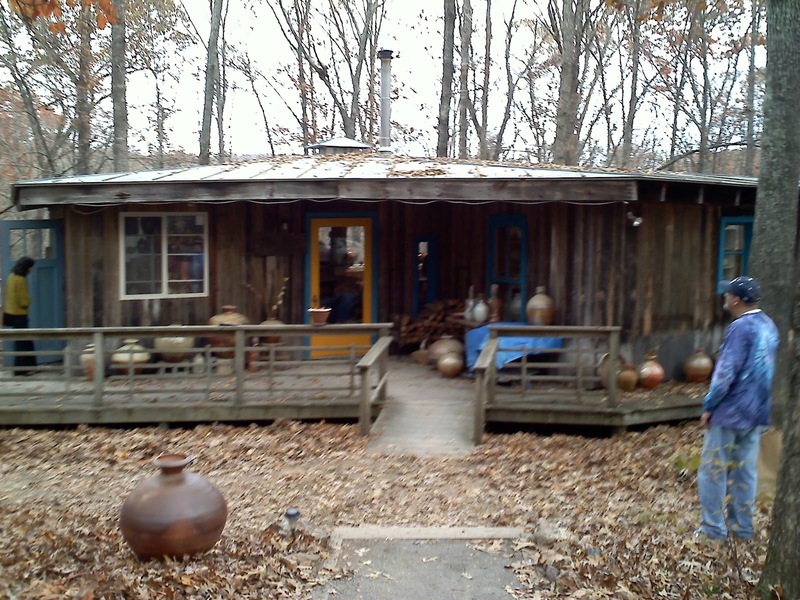 I have decided to take a studio at LibertyTown again starting in November. This will hold my largest loom and lots of pots! I plan on continuing to throw in a home studio. I love the control of my time and the kiln. And by spending time at LT I will still have access to tons of creative energy. Greg will move into a small rental house in November that allows dogs so Layla the wonder dog and I will be spending some time each week in The Burg starting in November. It will take some planning to balance my time between my pottery studio at the house in C'ville, and Greg and LT in Fredericksburg. So I may just break down and lower the AC in the studio and cross my fingers. I've been ignoring my blog of late. When I turn on my computer my home page stares at me accusingly. But here are some pictures and an update! I had my first whole sale order!! 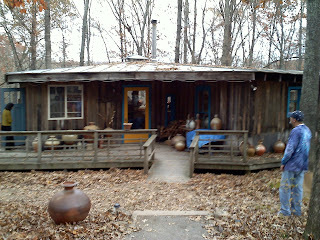 Jo at Miller Farms purchased a large quantity of my "farm ware" for her shop. I'm thrilled. 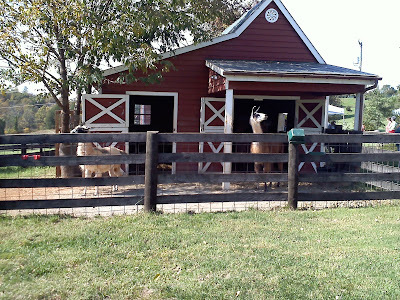 Their farm is a wonderful place. They raise beef cattle, provide seasonal pick your own, a produce and flower stand and a sweet farm gift shop. I have been preparing for My One Big Show this year. Fall Fiber Festival held in Orange VA. I have gone to the festival for years as a shopper (and BOY can I shop when it comes to all the gorgeous colored fiber....) but this year fiber sales will be down because I will be working at my own booth! I have no idea what to expect but I will have an abundance of pots. So we will see. This past weekend I attended a spinning retreat at Graves Mountain Lodge as a vendor. It was a last minute decision since I was concerned about my stock for FFF. It turned out to be a good decision, I had a few sales that made it worth my while (and still leaving plenty of stock for FFF) and it was a good dry run for set up and credit card logistics. SQUARE is my friend. Even with no cell service up there in the mountains we did have access to WiFi in the lodge so it worked perfectly. Tell me what you think of my new banner....I couldn't hang it up here but the plan is to hang it high. The next several weeks are VERY busy. Lots of concerts (this week is Ray LaMontagne with Brandi Carlisle opening on Thursday night and Head and the Heart on Saturday night). Sunday Greg and I will drive to Berryville to check out the Shenandoah Fiber Festival. I have never been and am hearing great things about this event. So plan to apply for 2012. Fall Fiber Festival is the weekend of October 1&2, the next weekend I will be a vendor in Frederickburg at the Let's Stitch event at LibertyTown Arts Workshop. And THEN two weeks later is the Juniper Moon Fall Shearing! In the midst of all my preparations, visits from friends and great music we are also preparing for some big changes. Greg has a new job starting in October so we will be moving BACK to Fredericksburg! After only a year here in Charlottesville. I won't be leaving Charlottesville until after the house sells. We won't list it till Spring and in the meantime I have my studio here at the house.